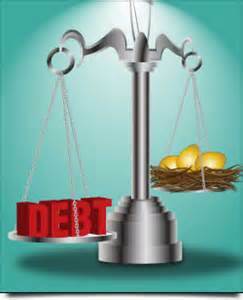 I am often asked why I hold to the concept of eliminating debt before I promote investing. Many clients believe that minimally servicing their debt in concurrence with investing their surplus cash will give them greater financial security long term. My argument is just the opposite. I believe that by doing this, it will minimize your long term investment returns. Let’s look at an example. If you charged $2,000 to your 19.99% credit card, your minimum payment would be 2% of the total owed which would equal $40 per month. Now, let’s assume you have an extra surplus of $100 a month. My system would be to use that $100 surplus in addition to the $40 minimum payment and pay down that $2,000 debt. Many clients want to invest that $100 while servicing only the minimum payment. Let’s take a deeper look at the results of both processes over the period it would take to eliminate the debt. If you paid just the minimum it would take you exactly 9 years to pay off this debt and cost you $2,332 in interest. Meanwhile, if you invested the $100 a month surplus at 8% concurrently, you would have grown your money to $15,848. But, remember you need to subtract the interest you paid on the credit card to get the true value of your return. In this case it is $13,516. Now if you used my system and paid the $140 toward your debt, it would be paid off in 1 year and 4 months and cost you $303 in interest. Now, if you invested that $140 for the remainder of the 9 years at 8%, or another 7 years and 8 months, you will have grown your money to $17,817. Once again, you need to subtract the interest you paid on your card to get the net effect. In this case, the total value of your money would be $17,514. The difference between the two processes is $3,998. My process is far better and nets a greater return. Now let’s compare what those two figures would grow to over a 30 year period if nothing else was added and we assumed an 8% annual return. The $13, 516 would grow to $147,807, but the $17,514 would grow to $194, 832. That is a $47,000 difference in return over a 39 year period. This is why it is so important to first eliminate your debt as soon as possible then invest after the debt is fully eradicated. It took me so long to grasp this concept. I think the idea of investing and investing early in life is drilled so much into our heads that we don’t see how debt hurts us. DEBT is equal to one thing and one thing only and that is RISK. Financial Risk prevents you from truly investing with your greatest wealth builder, your INCOME. If most all of your income is being paid towards debt over an extended period of time you’re losing the ability to truly build wealth. Eliminating debt and trying to invest at the same time is what I call Financial ADD, it is not logically or mathmatically in your favor as you can see by the previous post. Stay focused and accomplish one Financial WayPoint at a time. Slow Down to Speed Up! Remember the Tourtise always wins the race with the Hare. If you need me to prescribe some Financial Ritalin in your life just contact me.